I've never planted a fall garden before. "Fall garden" denotes planting in the fall, right? When it's cooler and I can stand to be outside, not when it's as hot as the inside of my oven on baking day, so humid you have to swim from the front door to the garden, and are being eaten alive by mosquitoes. Fall gardens must be planted in summer. When all of the above things are happening. And when the temperatures are really too hot for those little seedlings that must be kept hydrated so they don't fry in the heat of the sun, and protected from ravenous bugs such as grasshoppers and blister beetles. It all sounds impossible and doomed to failure. While in some areas of the country fall crops need to be planted right now, here in zone 7 we can wait a bit longer. Unfortunately it will still be hot but it will give me some time to plan and prepare. The first step to a fall garden is to identify the date of your average first frost. 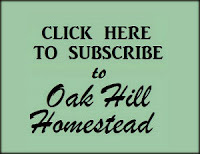 This page at Dave's Garden will give you a general idea; just enter your zip code. 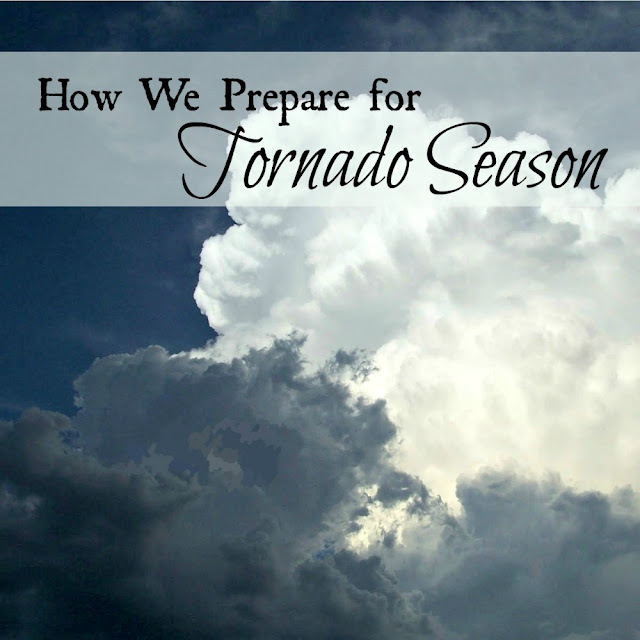 Of course this is just an average date; each year is different and there are no guarantees with the weather, right? Plus there are pockets of small eco-systems that will be warmer or colder than others. We live at a higher elevation than our nearest town so we tend to be a bit colder in spring and warmer in the fall. Dave says that our average first frost here in zone 7b is October 28th. Next, decide what you want to plant. 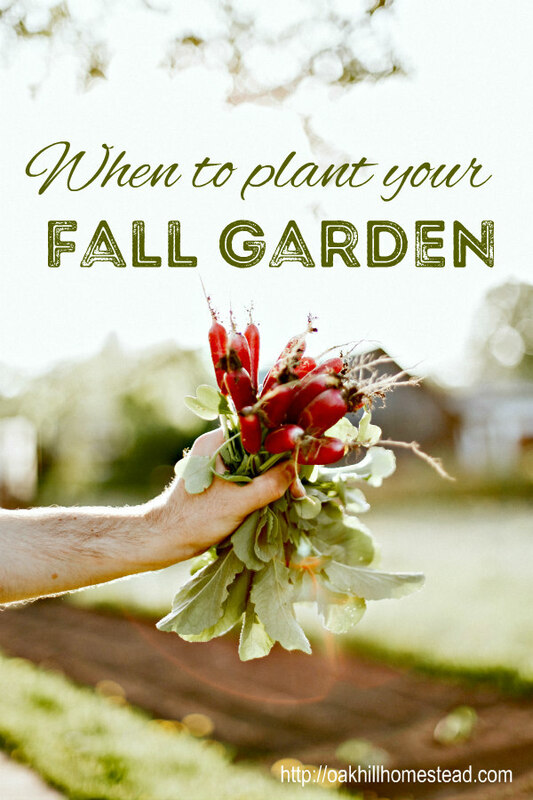 Short-season and cool-weather crops are best for a fall garden. Greens such as lettuce, spinach, kale (no kale in my garden, thank you! ), brassicas such as broccoli and cabbage, fast-growing root vegetables such as carrots and radishes, and other cool-weather plants such as peas are all ideal. Choose varieties that are fast-growing: check seed packets for their "days to maturity." You can compare several varieties of carrots, for example, and choose one that will mature early. Then count backwards to see when you need to plant each variety of seed. In other words, Early Scarlet Globe Radishes take 22 days to mature, on average. (The "Early" in the name is a good sign. This variety matures a full week ahead of others.) Count backwards from your first frost date for a planting date. 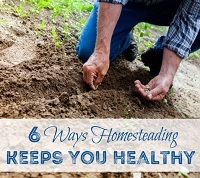 Add a week or two so they will hopefully be ready to harvest before an early frost, although most fall plants will survive a light frost if you cover them in some way. So in my case, October 28th [average first frost date] minus 22 days [number of days to maturity] minus another 7 days [an extra week] means I should plant those radishes no later than September 31st in zone 7b. I have an almost-empty raised bed ready for a few fall plants. I'm only going to try growing four different things, plants that I've grown before in the spring. The best way to try something new is to introduce as few new variables as possible, so I'm sticking to seeds I'm familiar with and have grown before successfully. While carrots are a fall garden staple, I haven't been successful at growing them before, so I'm not going to try again right now. The only "new" thing I'm working with is the season/weather. I've added compost to that nearly-empty raised bed. I've readied my low tunnel that's covered with mesh, so I can add it on top of the seeds as soon as they are planted. As well as protecting my tender seedlings from hungry bugs, it might just shade them a bit too, which could be a good thing. Like I said, I'm just trying to keep plants alive this fall. If I get any food at the end of this, it will be a wonderful bonus. 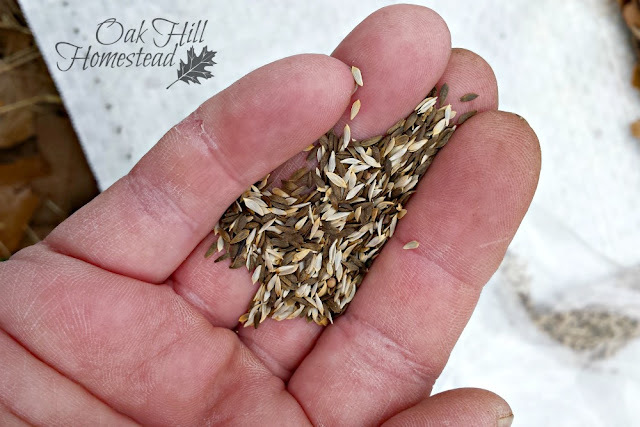 Here's my plan, using seeds left over from my spring order from Baker's Creek Heirloom Seeds. my Grandma made for me when I was a child. Delicious comfort food! Lettuce can be planted in succession. 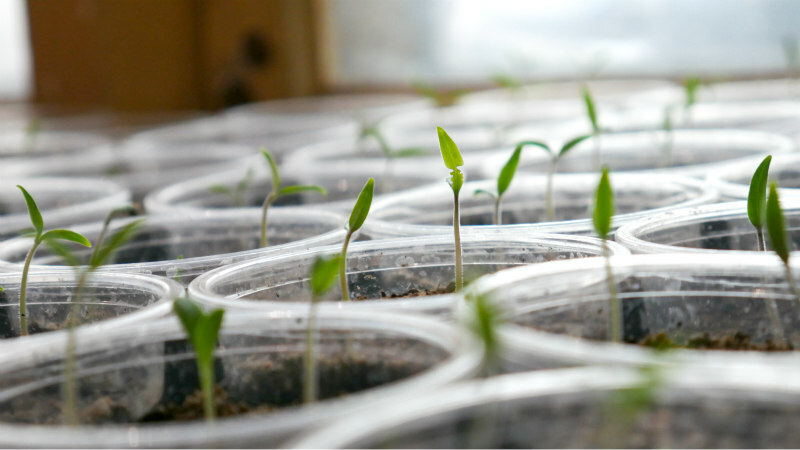 By sowing seeds every week, you can extend your harvest and avoid all of the lettuce being ready to pick at the same time. 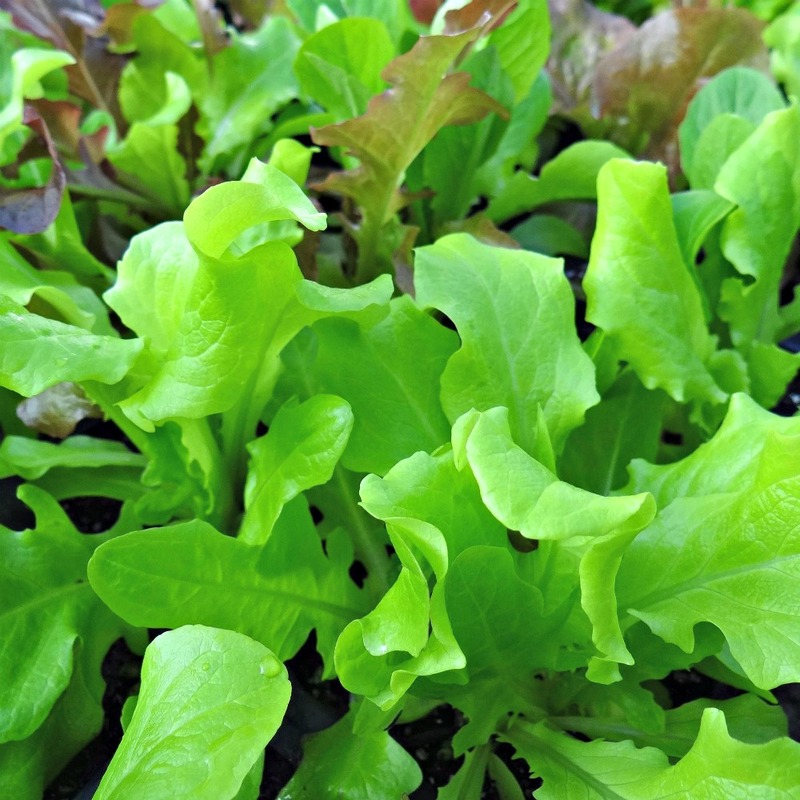 Lettuce loves cool weather and some sources say you can plant lettuce seeds until right before the first frost. Looseleaf lettuce matures faster than head lettuce and other types. I grow my own mix of looseleaf lettuce seeds. I dumped all my lettuce seeds in one seed packet several years ago, and add more each year of one variety or another. You can read more about my lettuce mix here. I might also get a packet of those Early Scarlet Globe radishes and plant them near the end of September, to be eaten in salads with the looseleaf lettuce. Since that's the only way we eat radishes, I won't go crazy and plant a lot of them. Here's how to store the leftover seeds in a seed packet so you can plant them next year. Since the four hottest weeks of an Oklahoma summer are in August, the beginning of September will still be pretty hot. 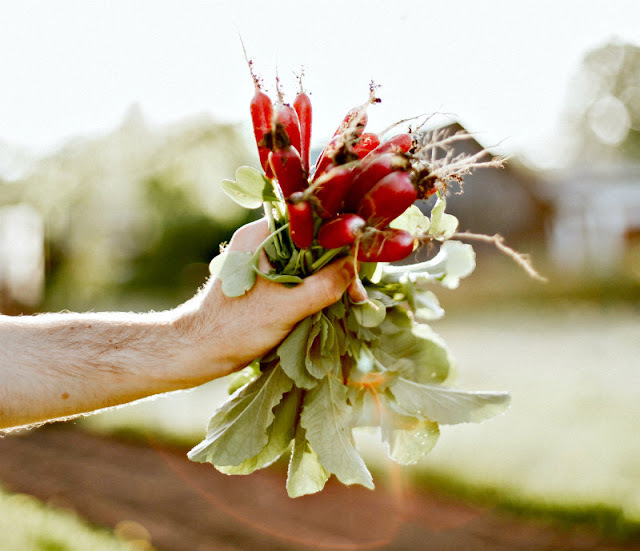 Beets and lettuce are the only seedlings that are recommended for transplanting; spinach and radishes should be planted directly in the ground. I'll plant a few radish and lettuce seeds indoors and more in the raised bed and cover them with the low tunnels and the mesh cover that I used on the cabbage to protect them from cabbage worms in the spring. We'll see which does best. Would you like to plant a fall garden this year? We're giving away a collection of 12 packets of seeds - courtesy of our friends at Baker Creek Heirloom Seeds - that would be great in a fall garden. Read on for the details. GIVEAWAY IS CLOSED! 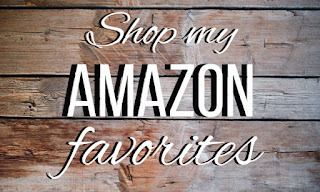 I'm joining nine other bloggers for this giveaway. I hope you'll visit them and read their fall gardening posts too. 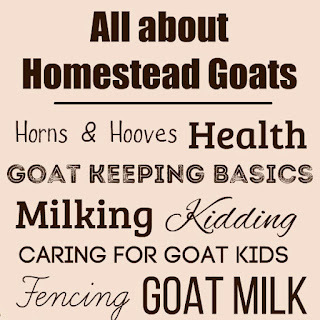 The Inquisitive Farmwife - Gardening Woes, But it's NOT too Late! Even if you don’t win, you can still head over to Baker Creek’s site and order your fall garden seeds! They’ve got a helpful staff if you have questions. 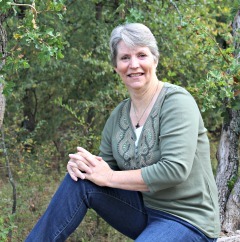 One of our participating bloggers toured Baker Creek's facility last year; you can read about her visit here. 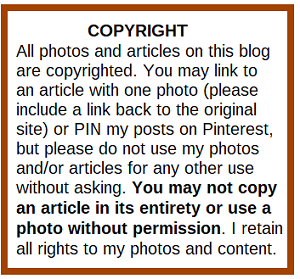 Want to PIN all of these great posts on Pinterest so you can read them or refer to them later? Pin the image below so you can come back to this list of posts. 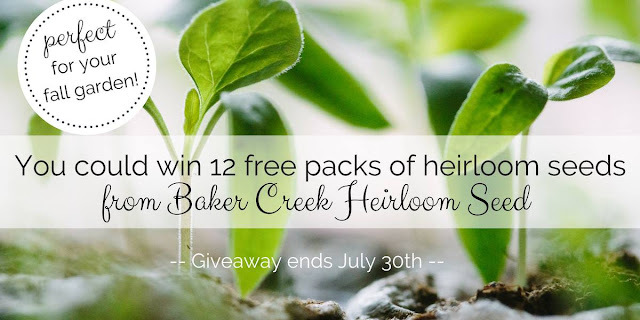 This giveaway is sponsored by Baker Creek Heirloom Seeds. 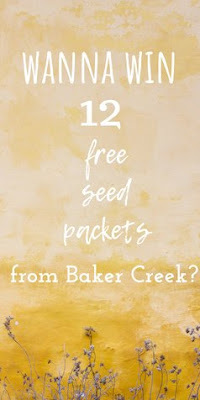 One winner will receive a package of 12 packets of seeds, perfect for planting in a fall garden. The giveaway begins at 6:00 a.m. Central Time on Monday, July 23rd, and ends at 7:00 a.m. Central Time on Monday, July 30th. We will announce the winner on Monday night; the winner will have 36 hours to respond or another winner will be chosen. Prize will be shipped directly to the winner by Baker Creek Heirloom Seeds. Eligibility: Open to U.S. Residents 18+. 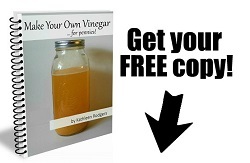 Winner will be chosen at random through Giveaway tools. No duplicate entries. Now that I think about it, mosquitoes and heat are also some of the reasons I never did a fall garden in the past. I can't stand being eaten alive! Hope you are able to have some success! I’m getting excited and encouraged about fall gardening. Reading everyone’s posts about what they’ll be doing is fun! Some years are just hard, Michelle, and you had a lot of other things going on too. I hope next year is better. I learned so much from your post! Thank you so much for sharing in such detail! I'm glad it was helpful, Terri! Sounds like you've got a great plan! 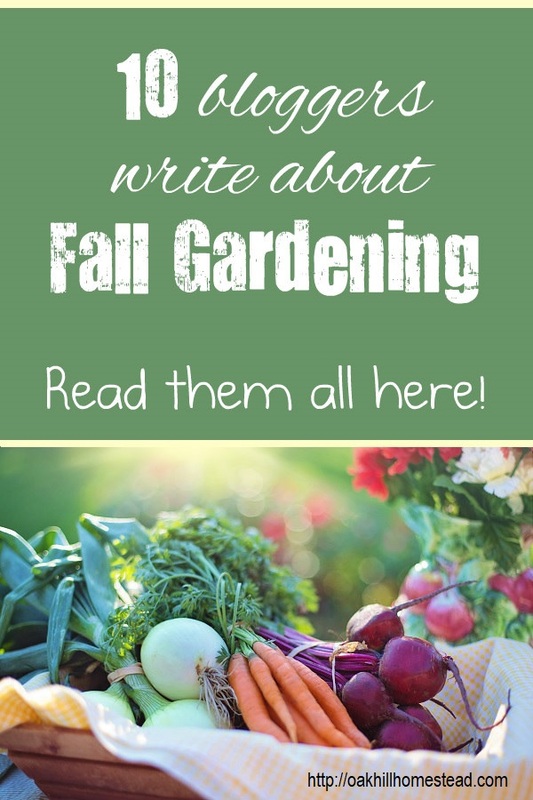 I'm looking forward to hearing how your fall garden did! Great tips! 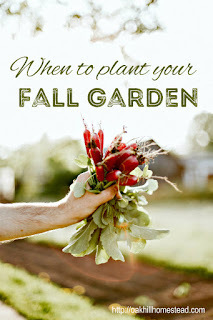 This will be our first year trying a fall garden so this was helpful! I'm so glad it was helpful, Clarissa. Good luck with your fall garden!